Back in 2014, movie goers were introduced to the calculating killing machine that was John Wick. More than just the hyper kinetic “Gun Fu” violence, convincingly portrayed by the very awesome Keanu Reeves (check out his training videos… wow), we were introduced to a fascinating underworld where the only inviolable rule was “no business is to be conducted on Continental grounds.” The second instalment into the steamrolling franchise gave a much deeper look into that world, and it was that world that really was the draw for some people- myself included. Sure, the action was ground breaking… no one had seen the kind of tactical shooting laid out by the Center Axis Relock system (CAR) before… and Keanu throws himself into the action like few other Hollywood actors. But it really was this world that existed underneath the one we live in, populated by gangsters, assassins, & thieves (all very stylish) that made John Wick more than just another action flick. 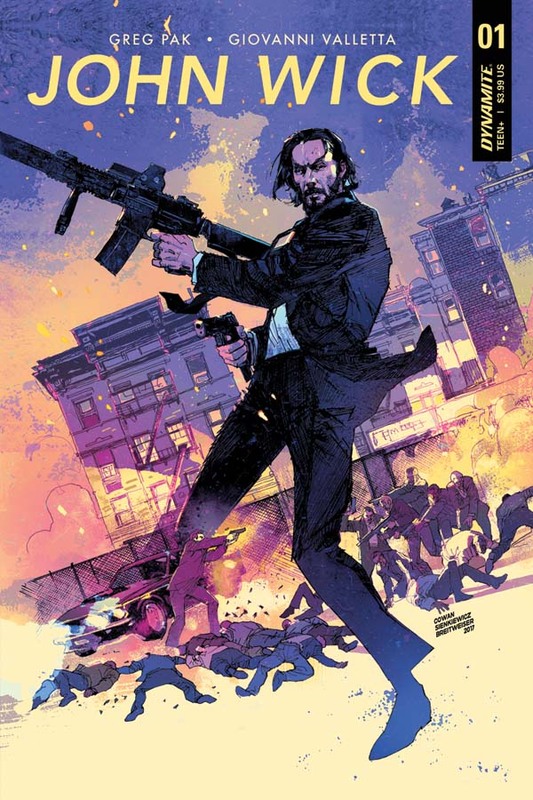 In a great show of cooperation and franchise building, the minds behind the movies have opened that world up for exploration in the world of comicbooks, with the full approval of all involved (yes, including Keanu Reeves). 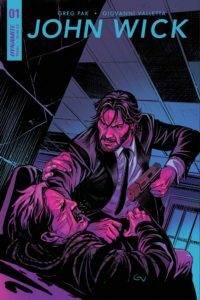 In this new series from Dynamite, we get to meet the always terse, always deadly John Wick, before he was “Baba Yaga”. El Paso, Texas is where we catch up with the young Mr. Wick, as he looks to maintain a low profile after his recent release from prison. Okay, now go back and read those first two sentences again, because that is the only indicator you’re going to get that we’re delving into prequel territory… which really is my only gripe about the book. 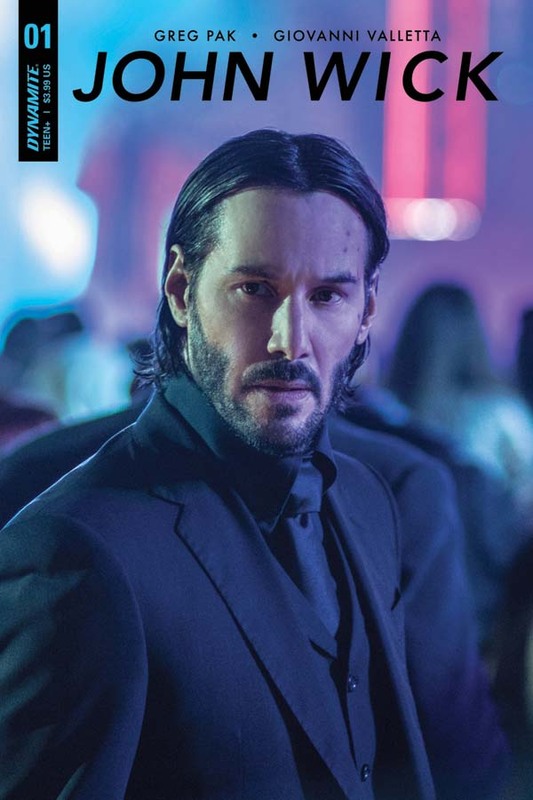 Wick looks pretty much the same as he did in the movies, no younger, and at my first read through I thought this was picking up after the second movie. I hadn’t read any blurbs about the book from the publisher, and it wasn’t until I settled in to get this review article ready that I looked a little deeper into the story and sussed it all out. It didn’t really matter, because the only real confusing points as far as the opening issue was concerned were in a meeting between Wick and a familiar face from both movies- something that really shouldn’t have gone quite so cordially after he’d been deemed Excommunicado– and the simple fact that none of the hoodlums he ran into seemed to have any idea who he was. 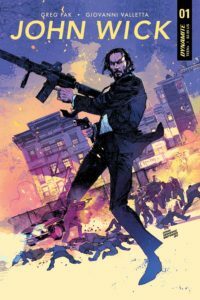 Thanks to the perfect union of Greg Pak’s writing and art by the team of Giovanni Valletta and InLight Studios, the origins of Baba Yaga promise to be an impressive foray into what made the movies great. Pak writes action very well, which shouldn’t really come as a shock to anyone who’s read his other work (um, Planet Hulk, anyone? 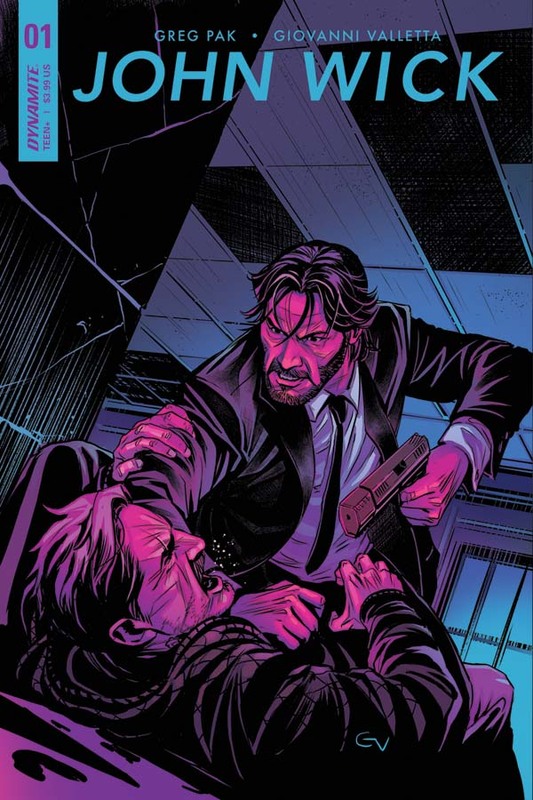 ), but he also does a great job of conveying Wick’s attitude and personality. He’s not a guy looking to make a grand entrance, much preferring to maintain his solitude, peace, and quiet… up to a point. When that point gets crossed, all bets are off, and the bodies get stacked. Which segues nicely into my thoughts on the title’s art, its overall look. The work by Giovanni Valletta combines the gritty everyday look of Wick’s world with the dynamic flow of the action scenes we experienced on screen. There aren’t any larger than life superhero types running around. The best criminals are those that don’t particularly look like criminals, or stand out in a crowd at all. Still, the characters in John Wick do have some impressive skills in their respective areas of expertise. 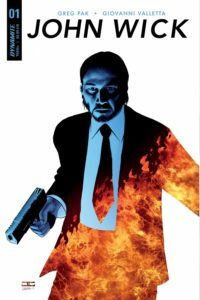 When those skills come into play, Valletta handles the action in a way that holds up to what the movies established. The whole package is wrapped up nicely with the colors by InLight Studios- blood sprays included- and letters by Tom Napolitano, whose input is mainly seen in the sound effects- all thuds and crunches. 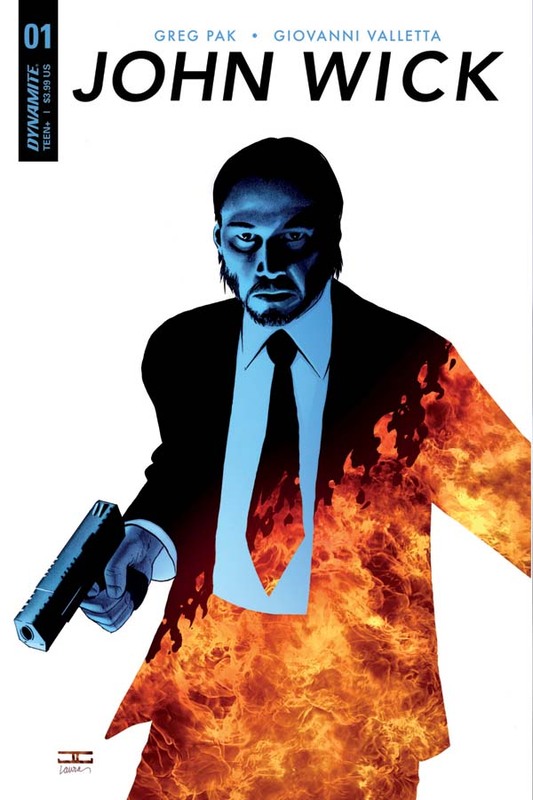 Let me just beat a dead horse for one quick second here, because again the only criticism I have at all is in the simple fact that Wick in this book looks just like he does in the movies… not the younger character the series is supposed to be about. I dunno, I half wonder if they weren’t totally sure where in the continuity they were working until it was too late to do anything about it. Grand scheme? Doesn’t matter, don’t care… just take our money and give us more Wick, please, that all may be forgiven. Some of us might’ve seen the movies more than once or twice… if you talk to my wife, she’d tell you that I’ve seen them “literally, millions of times”. Personally, I’m not sure she understands the definition of “literally”, but I see her point. 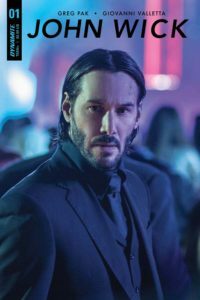 What I am sure of is that more of John Wick’s world is exactly what I wanted, and I very much look forward to seeing John establish himself as the legendary assassin who inspired the amount of dread/respect we saw in the movies. Just as a note, I got a message from David Curiel this morning, and he was not involved in the comic. The colors were done by InLight Studios, who he used to work with. The confusion same from the credits listed in our review copy, which did show Mr. Curiel as part of the art team.